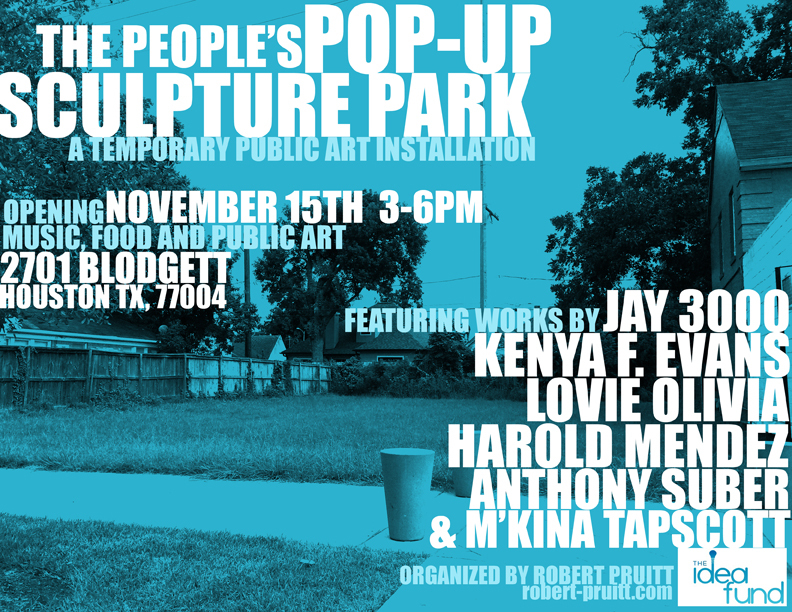 Houston-based artist Robert A. Pruitt will invite six artists to each create temporary, lightweight, large-scale sculptural works to be installed in a vacant lot which will then be made accessible as a usable park with accompanying tables and benches built by Pruitt. After one week, the park will be de-installed and re-installed in a new vacant lot in a different neighborhood. The neighborhoods selected are Houston’s Third Ward, Sunnyside and South Park – areas neglected by most of the established Houston arts community and which have receive very little civic investment in their leisure and social circumstances (as opposed to spaces like Discovery Green or Market Square Park).